City of Ghosts on display at the Nagoya Artists Exhibition. Update to the JapanesePhotos Instagram at: http://bit.ly/2yEjvrW. I’ll be there on Wednesday afternoon, late Friday, and some of Saturday and Sunday. This collection will expand in the coming year or so with more photos relating to this concept. A film expert discovered the first colour footage taken of London. After reviewing this footage, he felt that whilst cities are permanent, in fact London has changed little since 1927, the people are constantly changing. Our lives are fleeting and transient, and so he said that people are like ghosts passing through the city. In fact, we live our lives, and carry out our affairs with earnest, energy, seriousness, and with hard determination. All of our struggles, achievements, disasters, love, loss, happiness, sadness, and more are lived out in these spaces called ‘a city’. However, what remains of our individual lives after we die? Very little. The architecture, the monuments, the transport spaces, offices, work spaces, the market spaces, the houses, and the culture of the people who survive today, which will be passed on and tweaked by each new generation. Otherwise, there is no memory of the individual people will remain, except for a few monuments. Even though we are alive now, we are already merely ghosts passing through the permanence of the city space. Um especialista em cinema descobriu as primeiras imagens a cores tiradas de Londres. Depois de revisar estas filmagens, ele sentiu que enquanto cidades são permanentes, de fato, Londres mudou pouco desde 1927, as pessoas estão constantemente mudando. A nossas vidas são fugazes e transitórias e, portanto, ele disse que as pessoas são como fantasmas passando pela cidade. Na verdade, vivemos as nossas vidas e realizamos nossos assuntos com ânsia, energia, seriedade e com determinação. Todas as nossas lutas, conquistas, desastres, amor, perda, felicidade, tristeza e mais, são vividos nesses espaços chamados de “cidade”. No entanto, o que resta das nossas vidas individuais depois de morrer? Muito pouco. A arquitetura, os monumentos, os espaços de transporte, os escritórios, os espaços de trabalho, os espaços de mercado, as casas e a cultura das pessoas que sobrevivem hoje, que serão passadas e ajustadas por cada nova geração. De outro modo, não há memórias de pessoas individuais que permanecerão, com exceção de alguns monumentos. Embora estejamos vivos agora, já somos meramente fantasmas passando pela permanência do espaço da cidade. Strange autumn in Japan. As Typhoon Lan approaches, green leaves fall in Sakae, Nagoya. Update to the JapanesePhotos Instagram at: http://bit.ly/2xdWx6q. The latest art project is the culmination of ideas relating to cities, humanity, history, future, and the present. Actually, the inspiration came from the first colour film of London made in 1927 (BFI, and YouTube). I can’t find the original quote, but a photographer or the film restorer felt that whilst cities are permanent, in fact London has changed little since 1927, the people are constantly changing. Our lives are fleeting and transient, and so he said that people are like ghosts passing through the city. In fact, we live our lives, and carry out our affairs with earnest, energy, seriousness, and hard determination. All of our struggles, achievements, disasters, love, loss, happiness, sadness, and more are lived out in these spaces called ‘a city’. However, what remains of our individual lives after we die? Very little. The architecture, the monuments, the transport spaces, the market spaces, the houses, and the culture of the people who survive today, which will be passed on and tweaked by a new group of people over generations. Otherwise, there is no memory of the individual people except in what remains of treasured architecture and monuments. Even though we are alive now, we are already merely ghosts passing through the permanence of the city space. This series, Ghosts in the City, was done with a great model Miyu, and make up artist Ksara. The photos were taken in and near the famous Shibuya Crossing (aka, The Shibuya Scramble). The very same place that is used in movies, like Resident Evil, as a symbol of modernity, Tokyo, and Japan. The shoot was done in the early evening in the hope that the crossing would be crazy-busy with people getting across the scramble. To purchase these images for prints, private or commercial download, go to the Ghosts in the City gallery and to the “Buy” button. Every new year needs a review of the old. Ok, yes, this is coming a little late, but timed for when most people are back at work and can benefit from this. The top 5 photos are available at both my PhotoShelter portfolio and my agent’s website. 5. 20-Somethings on a day out in Osaka. Actually, in my list of 100 top photos of all time, nothing from 2013 appears, yet. However, on a photographer’s social networking site, 500px, this was one of the top photos, and was listed at “Popular” for a couple of days: an achievement. Both models were a delight to work with, and it was a fun morning. Thanks Ana and Brooke 🙂 This photo is available on my PhotoShelter portfolio and can be seen at 500px. Young twenty-something friends on a day out in Osaka. This photo also doesn’t (yet) appear in my list of top 100 photos of all time, but again on 500px it was a top performer, with a remarkable peak rating of 92.5 (squee!). What could be more popular than the above ‘City Angel’? Naked men giving each other wedgies, of course! The Naked Man Festival is a winter event, and will be on again soon, and yes, this really is one of the top 100 photos of all time. From a quick check of my previous blog posts, I’ve written quite a bit on the annual Naked Man Festival, held in Komaki, just outside of Nagoya. I don’t know why, but Korean royalty is one of the most popular photos on JapanesePhotos.Asia. Obviously they are actors performing for tourists at Gyeongbok Palace. Incidentally, it was Japanese assassins who killed of most of the Korean royal family, paving way for a Japanese annexing of the peninsula starting from 1910 to 1945. This was a time when the Korean people were brutally treated (Wikipedia), and is still an open wound that current Japanese politicians do not or won’t understand (Japan Today). 1. One of Japan’s top jazz ballet dancers leaping. I did this collection of photos with Ai in 2012, and this one was the top favourite in 2013. You can see my previous blog post of this photo in a tearsheet, and other previous Jazz Dance posts, too. It’s always a pleasure to work with jazz dancers, they know how to pose, they enjoy performing, and they have infinitely more energy than I. A new jazz dance project is in the planning stages for winter 2014, so keep an eye out for that, and please show support with microdonations on Flattr, every little bit helps. This Photo of the Week is of Brooke, an expat living in Japan. It was a great pleasure to work with her recently. Just over the weekend I published an early version of this photo on the photographer’s sharing website 500px where it was title “City Angel”, and it scored really high peaking at 92.3%; it was very well received. Photos of Brooke are available for licensing at my PhotoShelter portfolio and perhaps later at my agent’s website. Outdoor portraits of a twenty-something Caucasian lady. I had the privilege to work with two of the best jazz dancers in Japan for this little project. These girls are professional dancers, choreographers, and instructors, so they know what they’re doing, perhaps better than I. Jazz dancers often also train in contemporary ballet, so presented here is a mix of jazz dance, ballet, yoga, portraits, ‘city ballet’, and a whole lot of fun. Some of these images are available via my agent at Asia Photo Connection (Henry Westheim), whilst others are available at my own portfolio. This Photo of the Week was one taken last summer. 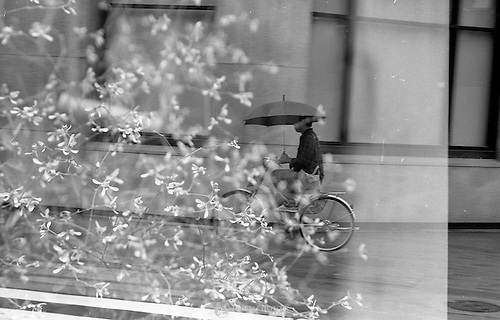 It was taken on film, and as a double-exposure. It was then digitised complete with grain, dust spots, and other charisma. This series of photos Poem of a Cacophonous City is more in the art realm… than of poetry, but then poetry is also more in the art realm than something like a police report. Anyway, the point is that it will look great on cafe walls. This series is meant to convey the business, the proximity, the noise, and general clutter of the city. However, this particular image is meant to convey a different kind of clutter. The spelling, or mis-spelling of the titles this particular picture has had include Ex-plain, Explane, and Explain. Essentially it toys with the idea that Nagoya, the city where this photo was taken, was a flood plain, or a delta, that was regularly inundated after each snow melt, where new sediment was deposited. Now, there are flood barriers, and in the last 40 years, the general Nagoya area has sunk about 20cm, and especially sinks during and after each shaking of the sediment from earthquakes. So, this former, or ‘ex’-plain had pretty flowers here once, and now it’s a city. But why put a city here? Explain to me, that. Especially because sedimentary plains shake more in earthquakes causing more damage, and the whole basin will be below sea level quite soon. Isn’t it a poor choice to have one of the richest cities of the world? It’s rare that Nagoya gets snow, and this winter is one of those ‘once in seven year’ events. These photos will soon be available on Asia Photo Connection. Company employees carefully crossing the street in icy conditions on a snowy day. A construction worker clearing snow off a pedestrian path in front of Nagoya Station. I did what I’m calling a “portrait walk”, where I met a friend who agreed to be a model, and we walked from point A to point B in the centre of Nagoya. As you can see she’s looking great, very fashionable… but cold, and hence the puffy jacket (and I froze, too). It was a great chance for me to get a handful of photos I’d been meaning to get, including someone shopping; using a drink vending machine; a mobile phone used in the open; and expectantly, she is great with a spinning top! It was interesting, she asked ‘why a vending machine?’. A natural enough question for a Japanese person; vending machines are everywhere, and they are so ubiquitous that they are nothing special. I pointed out that vending machines in Japan are as much of a symbol of Japan as Big Ben is to London, or the Eiffel Tower is to Paris. A point you might miss that is quite interesting. In winter, they change the settings of some some part of the machine to heat a selection of drinks. All the drinks with red price labels are hot, whilst all the ones that are blue are chilled. Most drinks price in the range of 110yen to 150yen. The vending machine we shot could take money in four forms being of course coins, notes, Manaca card, and Waon card. Manaca is an embedded ic-chip card that just needs to touch a sensor surface for credit to be transferred. The Manaca is used mainly as a regular commuter access card, but can also be used in many convenience stores and vending machines in Nagoya. I don’t know if it’s usable in other places like Osaka or Tokyo, but I think they have their own systems instead. Finally, I have little idea of what the Waon card is. I think the Waon card might be connected to the Aeon shopping mall conglomerate.